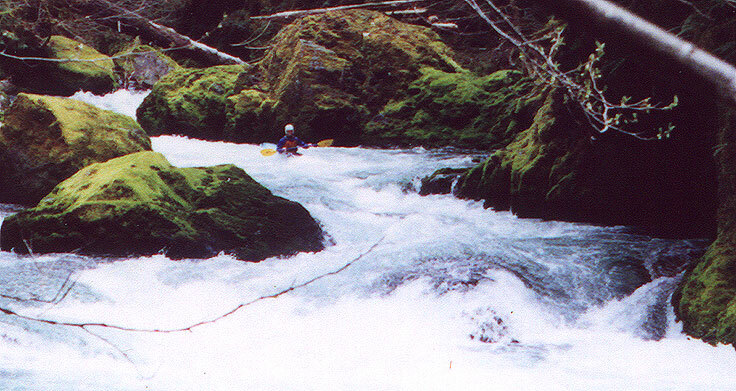 Salmon Creek Gorge was pioneered by Brian Tooley in the early nineties and to this day isn't run all that often. Boaters paddle this section will find big, pushy boulder gardens nestled in a lush mile long gorge. The entire gorge is easy to scout or escape if you get in over your head. This run usually culminates with a run over Salmon Falls and can be combined with the five mile class III section below the falls. Anyway, back to the creek. Below Holy Terror are three class three drops in a row. The first has wood on the left and middle as of April 2000, so run it far right. The second drop has a log spanning it but you can duck under and run down the middle off the pillow. The third in this series is a fun chute that ends in a pool above the final drop. 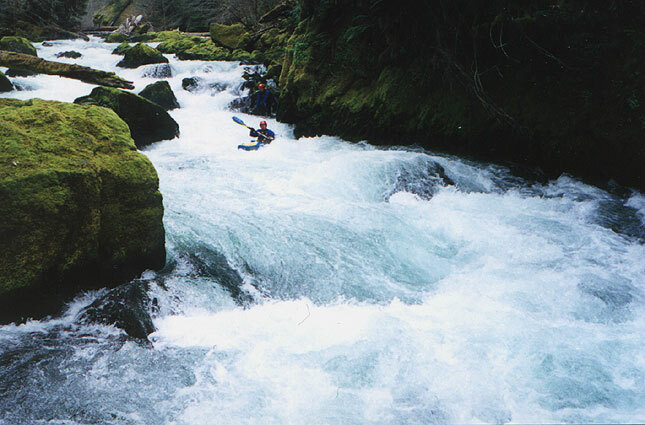 The last major rapid consists of three drops that start where the creek takes a sharp right turn and is almost completely blocked off by an enormous boulder on the left. Catch the large eddy on the left behind the boulder and scramble up on top to scout the first part of this drop. At the top of this rapid the creek narrows down to about ten feet and drops over a uniform three foot ledge. Last year the boof was partially blocked by wood which is now gone. Below here boaters charge down and do a wild airplane turn to the right at the bottom of the second drop, avoiding the large hole river left. Below here is a short pool above the last big drop. The final drop in the gorge is another steep boulder garden that careens down into a large boulder at the bottom that is a huge hole at high flows. This is the last drop in the gorge. Ely runs the bottom drop in the gorge. Below the last boulder garden the creek is class II all the way to the bridge. Below the bridge is more splashy class II until you arrive at Salmon Creek Falls Park. 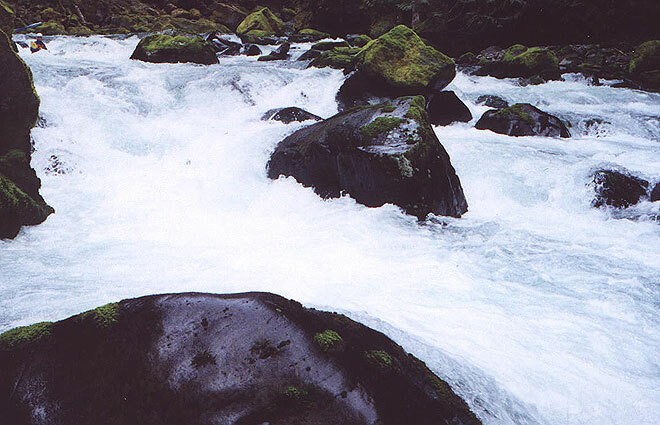 Here the river takes a sharp right and plunges through a III+ drop that begins with a line of boulders almost completely blocking the creek a hundred yards above Salmon Creek Falls. Below the falls the creek resumes its class II character until you arrive at the final III+ drop above the footbridge. Here the creek descends through a long series of evenly spaced ledgy holes in a small gorge. At high water the last hole on the bottom right has sent a few boaters swimming, so watch out for it. Access: From Eugene, take highway 58 to Oakridge. Drive through Oakridge and cross Salmon Creek. Look for the fish hatchery signs and turn left there. Continue up this road for about a mile until it ends at Salmon Creek Road (FS 24). Turn right here and drive 2-3 miles and turn right on a small road (FS 207). Right before FS 207 crosses the creek, a footpath leads off to the right. The footpath crosses the creek about two hundred yards away and this is the take out. You can scout the last III+ rapid from the bridge. Return to FS 24 and drive up to Salmon Creek Falls Park and scout the falls from the wall of the gorge. After scouting the falls, continue up FS 24 and until you see a road (FS 2408) taking off to the right, crossing the creek (an alternate put-in if you want to miss the gorge). The put in for the gorge is 1.5 miles above here. Stay on FS 24 and drive up 1.5 miles, looking for a small rut-filled turnout on the right. Scramble down the path and put in. Don't bother continuing upstream unless you enjoy endless class two with tons of wood.